The customers wanted a painting that captured some well-known landmarks around Vancouver. The elements they like most about Vancouver are the Lion’s Gate Bridge, the mountains, the totem poles in Stanley Park, the yellow sulfur piles, and the floating Chevron gas station. This is an aerial-ish view with some characteristic exaggerations to fit all the elements in. I’ve also included the Brockton Point Lighthouse, several freighters, a harbour plane, a departing cruise ship, and even a couple of kayaks. 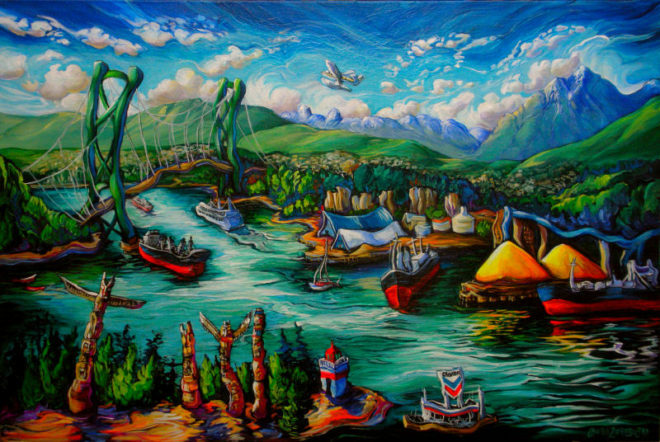 It’s a busy painting, but Burrard Inlet is a busy place!